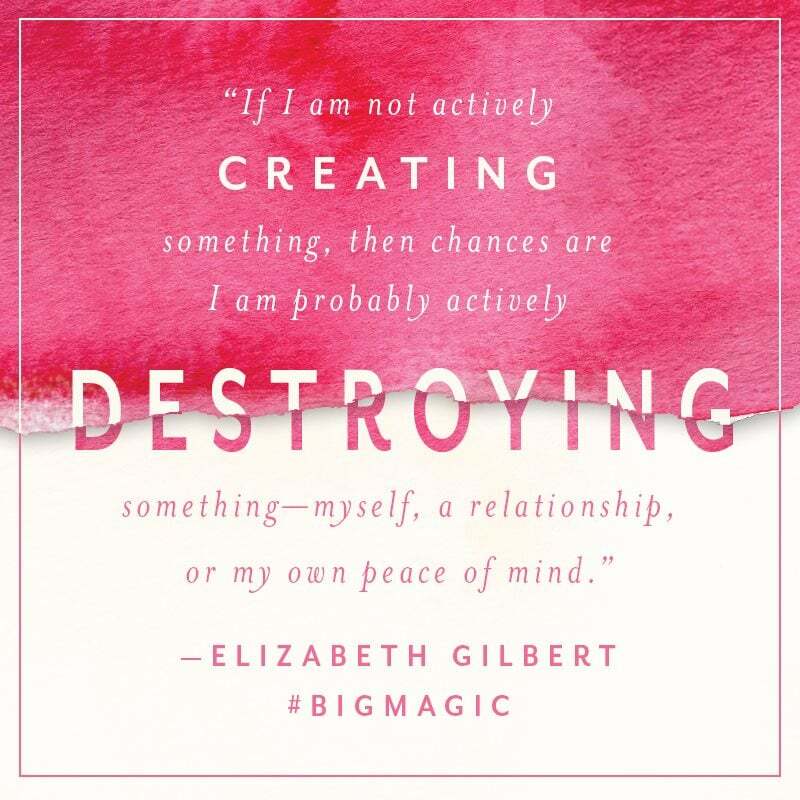 Recently, I listened to Big Magic by Elizabeth Gilbert. She is the author of Eat, Pray, Love (which I have not read). I’ve been in a creative slump for a while now and it was partially self-imposed. I mean, I’m still in it but I feel like I’m starting to peer out from the fog. I spent this past summer in such a state of high anxiety that I was freaking myself and everyone else out. I think it was two things: 1) A pill that a doctor prescribed me “in case my thyroid was under-active and 2) Because I was trying to force myself to be perfect. Now, I’ve brought up a lot of ideas, let me unpack them below. I’ll start with the under-active thyroid, move onto perfection-seeking, and glide right into Big Magic; how does that grab ya? Good? Alright let’s get started. Earlier this year, we had decided to take the plunge towards researching fertility. We’d like to have a baby and I’d like to carry it. I’m interested in delivering via midwife and they provide gynecological exams so I figured I’d go for my annual at the midwife’s office. When I started talking to them about wanting to get pregnant, they referred me to go to a fertility doctor. Because of my weight and age, I’d be a “high risk pregnancy” and she figured that it would be best for me to work directly with an expert to make the changes of success higher. Okey doke. We started going to the fertility doctor she referred (which is the type of place that Kim Kardash might even find hoity toity) and they started doing all kinds of rounds of physicals and what have you. I mentioned that I feel like my thyroid might be underactive and when the bloodwork came back, it was inconclusive but she still put me on the smallest dose of synthetic hormone possible “just in case”. I dumbly took it because when you’re trying to get pregnant you’re just kind of like “sure, sure” to whatever they want. I researched it online and found all sorts of side effects (such as anxiety) that were possible but I put it out of my mind. Fast forward a few months and I’m a goddamn mess. I’m an anxious mess at work. I’m an anxious mess at home. I’m basically in a 24/7 panic attack. I couldn’t think, was easily overwhelmed, and plain old frantic. I think that part of the anxiety was warranted. I am going through some personal things with my family right now that aren’t affecting me on the surface but are likely affecting me somewhere inside. Also, work happened to be very busy and frustrating at the time and I was bringing a lot of tension home with me. When I was home, I started putting pressure on myself to be twelve thousand things. I wanted to write a book, start drawing, learn the tarot, start doing yoga, build a successful blog, write a graphic novel, take up photography, learn photoshop, swim often, go to the gym ever morning, walk the dog; the list never ended. Because I had too much stuff on my list, I couldn’t focus on any one thing. Because I couldn’t focus on anything, I couldn’t get anything done. I wanted to be perfect but there weren’t enough hours in the day for it. In August, I scheduled a one week vacation upstate with Kristyn. The week before I left for vacation, I got into a fight with my coworker, my back hurt from tension, and I was fast forwarding the time it would take to get out of there. I had started to remember that the synthetic hormone could mess with my anxiety so I researched it and found A LOT of horror stories from people on synthetic hormones who found it to be hell. Apparently, you have to mess with taking different levels of medication before you can get it correct and if you over or under-dose, you could end up feeling like a lunatic. It was then that I realized that I’ve never seen a GD endocrinologist and that my bloodwork came back inconclusive. I was taking a medication that I didn’t even know if I needed. Since I was in a crazed loop, I was probably taking too much or too little. I decided to stop cold turkey. I know, I know, I know. You’re not supposed to stop taking medication like that. I’m a rebel, Dottie; a loner. I stopped taking it and THEN went on vacation. While on vacation, I was in a low grade panic attack the entire time we were there. It was interesting because I kept seeing the face of my boss and the coworker I fought with. I truly love these two humans. They are great people in general and awesome people to work with. However, they were two emblems of stress because we work a lot together and that’s the nature of that. As the week wore on, I grew less stressed. Our days were filled with reading, swinging on the hammock, sleeping in gravity chairs, drinking rum and seltzer or tea, campfires, and generally just chilling. Still, I was convinced that I was going to get fired when I came back. I was sure that they hated me. I was resigning myself to being let go. I was even starting to welcome the possibility of it as something that might be really good for me; a fresh start, a new opportunity. WELL. I came back to the office and everyone was thrilled to see me, especially the coworker I fought with. 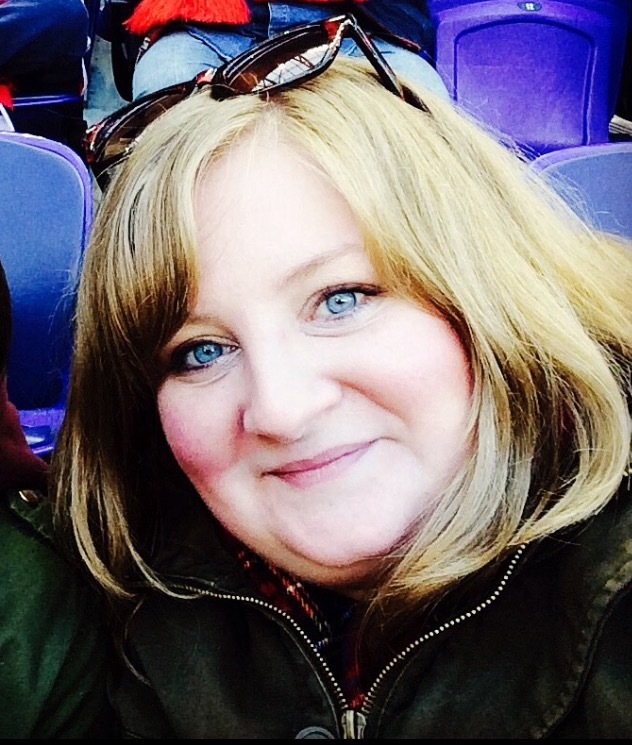 I was anxiety-riddled to come back into the office but when I came back, there was no work that was on fire. Everything was fine. My boss was on vacation so I had time to re-acclimate to being back and catching up. When he came back the next week, he gave me my mid-year review. Apart from a few minor pieces of constructive criticism, the review was great. He told me that I’m doing a great job, he wants me to keep going in the direction that I am, that any criticism he has with my work, he’s just sure it’s growing pains as I mature into the position and beyond. He asked about my vacation and told me about his. He told me that if I ever need anything, have any questions, or need any help to feel free to come to him; no matter what. Basically, you guys, Momma is crazy. Literally all this stuff was in my head. All this anxiety, all this paranoia, all this negativity, it was all imaginary. And the thing is, as time wore on, I noticed my mood lifting. I noticed myself calming down. I noticed myself being able to focus. I started exercising which lifted my spirits. Exercising also made me start eating better. Lately, I’ve been silly again and have been getting compliments from all sorts of people. I don’t know, you guys, I kind of think that a lot of that had to be the medication. Look, if I go to an endocrinologist and she says that my thyroid is under-active, I have to go on synthetic hormones (probably). If you’re thyroid is out of whack and you’re all “LOL whatever”, you can do permanent damage to your entire body. However, if my thyroid is fine and all I need to do is exercise more and eat right, that’s what I’ll have to do. THAT by the way, will also make me feel better emotionally and physically. Back to Big Magic, however, because that’s where we started. This book came out last year at this time and the cover art drew me in. However, I wasn’t interested in reading it. While on vacation, we went into a hippie book shop in Woodstock and we found it on a table next to other books about creativity and self-actualization. I decided not to buy the physical book but to buy the audiobook and to listen to it since it was self-narrated. GUYS, this book is one that I think I’ll come back and listen to once a year for a kick in the seat of the pants. It was very disarming. It was narrated by the author (and I love it when an author can really successfully self-narrate their own nonfiction book). It didn’t read like a self-help book. It wasn’t woo woo either. I’m not against self-help or woo woo as genres but that’s what I expected and didn’t get. Instead, it was like sitting and listening to your most enlightened friend give you really great advice about your life; the type of advice you weren’t aware you needed but when you got it, you knew you needed to hear it. The quote above is something that resonated with me on two levels: 1) She uses a dog with separation anxiety as an analogy for creativity. She says something like “Just like a labrador ripping up your carpet when you’re not home, if I’m not being creative, I’m being destructive.” I’ve come to this conclusion myself in the past. For me, I like to say “People need drama in their life; you just have to decide whether it’s positive or negative drama.” I honestly believe that if you don’t fill your life up with positive drama (school, creative projects, etc), you’ll find ways to create it in your life by fighting with people or just self-destructing in some weird flailing way. 2) She made me realize that I need to take Shirley for more walks in order to make her more relaxed at night, to stop eating the carpet, and to stop using the cat’s litter box as a snack station (gross). The problem with how I approached creative solutions was OVERKILL. I was like “Me unhappy, me overload brain.” Guys, I fried the controls. Another weird thing that I invented and then found that someone else had two is something I called “The Four Building Blocks”. When I was freaking out about work, a reason why was that I felt like I was being pulled in too many directions. I reached out to a distant colleague in a similar job position as me to ask for advice and ideas. She asked me this question “Whose voice do you speak in?” I asked her what she meant and she clarified, “In your role, who do you serve? Who do you advocate for?” Because we are both in sort of an outward-facing role, she meant, do I advocate for my clients, the business, or some other thing. I didn’t have an answer to that because, in my role, I was speaking in too many voices. I needed to pare it down. I decided to rewrite my job description and pare it down to four foundational blocks. I decided that if my work didn’t touch one of those blocks, I wasn’t doing it. Later, I read an article that used the same principal but applied it to your personal life. They said that you should pare your priorities into four building blocks that do this: 1) Make you feel forward-moving, and 2) Make you feel like yourself. For my personal life, I translated this to mean that for now, in this season of my life, I want to focus on four things: 1) Personal Life (Kristyn, social life, and home), 2) Work, 3) Health, 4) Learning. “Learning” is a little ambiguous, I realize. Mainly, right now I’m choosing to have that mean “reading”. However, I’ve decided to let “Learning” take the form it wants, depending on my impulses. For instance, right now, I decided to sit down and write a 2000 word essay on my struggles this summer. This is way more personal than I decided to write on this blog but it’s closed so whatever. I’ve been saying “guys” but I do believe that Kristyn is the only one able to read this (unless the subscribers are still able to, I have no idea). If that’s the case, that’s okay too. When I started this blog, I used to write free-form like this and would just jaw on about whatever I pleased without fear of recrimination. I let paranoia take root and it ruined something that I loved; writing for an immediate audience on this here blog. The thing is, writing on a word doc does NOT get my creative juices flowing. Something about writing on a blog and knowing that it will be shared with at least one other person makes it easier for me to let my thoughts flow onto the page. I guess there’s a feeling of impermanence as is the case with blogs. I know that “the internet is forever” but I am who I am. Anyway, I’m running out of steam and I’d like to read for a little while before bed. I have two more days left in this week to slog through before we can go back upstate this weekend for my 37th birthday. Actually, a weird thought that I just had was that I believe that I started writing this blog in 2007 or 2008. That means that this blog is almost a decade old. Can that be right? Oh who cares. Time is a thief!